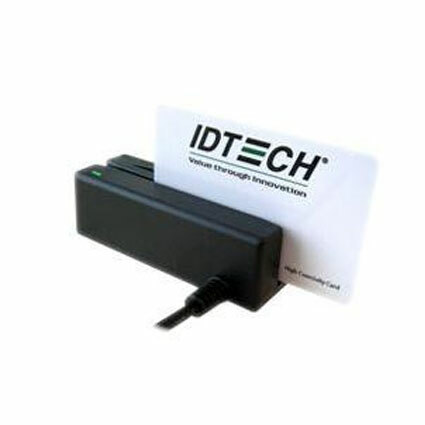 The ID-TECH MiniMag Intelligent Swipe Reader is designed for POS and desktop applications where space is at a premium. The entire unit is just 90mm long (about the length of a credit card), giving it the smallest footprint of any unit with comparable features. It can read up to three tracks of magnetic stripe card data regardless of swiping direction or speed which increases usability. MiniMag’s compact footprint is ideal for POS, security, loyalty and other applications where space is limited. The uniquely designed flat surface allows for mounting in different orientations using threaded inserts or Velcro. The cable can exit through the side or bottom which provides flexibility in mounting options. The <b>ID-TECH MiniMag</b> Intelligent Swipe Reader is designed for POS and desktop applications where space is at a premium. The entire unit is just 90mm long (about the length of a credit card), giving it the smallest footprint of any unit with comparable features. Dimensions (W x D x H): 1.28" x 3.94" x 1.23"